It’s so fun to be at Just Romantic Suspense. What a great site! I’m excited to share the release of my first book in my upcoming romantic suspense series. I love writing series books. In fact, I’ve never written a book without thinking about how it could be part of a series. Not a series where the same main character is the lead in all books, but a series that brings a team of characters together to fight odds greater than themselves. I love how the characters band together. The camaraderie of the team. The different personalities clashing, then working to resolve their differences. The support and bond they form. The sense of family they develop. Web of Deceit is part of such a series called Agents Under Fire and it releases on March 5th. This series features three FBI agents who are part of an elite Cyber Action Team called in to solve the most difficult cyber intrusions. You know, intrusions like you’ve heard about on the news with companies like Target and Home Depot. But these stories go beyond simple credit card theft. In each book, the intrusions are very high-stakes that involve national security and serial murders. And, each intrusion takes a crazy turn and the agent suddenly finds herself in a run for her life. 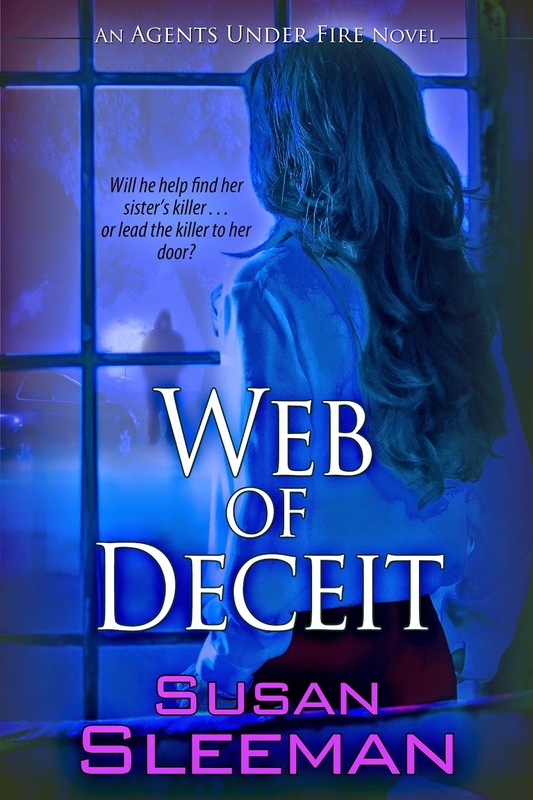 Web of Deceit features agent Kaitlyn Knight and homicide detective Sam Murdock. When Kait discovers her brother-in-law is Vyper—the notorious cyber criminal and murderer wanted by the FBI—she doesn’t question her duty to arrest him. But when he murders her sister in front of her, leaving her infant niece motherless, Kait vows to hunt him down and bring him to justice while raising the baby. Three long years she searches for him without even a whisper of a lead. She’s about to give up hope of ever finding him. All of that changes when Vyper goes on a murderous spree taunting Kait with clues that she and Sam must solve before her devious brother-in-law takes another life. As the body count rises, Sam discovers the killing spree is really about striking back at Kait. He must put everything on the line—including the relationship he’s developed with Kait—to ensure her safety. The killer is waiting, watching her every move and he won’t stop until he’s exacted his revenge and reclaims his rights to raise his daughter. Will Sam help find her sister’s killer . . . or lead the killer to her door? There was blood. So much blood. Covering her chest and staining the thick wool carpet. Kait ripped off her blazer and pressed it against the wound. Sticky, warm, it oozed through her fingers. Bile crawled up the back of her throat. She looked away to stave it off and dialed 911, the operator promising a swift EMT response. Kait dropped her phone and turned to Abby, whose face was ashen and drawn. Her mouth opened and closed as if she needed to speak. Terror for Abby threatened to take Kait down. Hold on. Stay in control. She needs you. Abby moaned, the sound cutting to Kait’s core. “No, promise me, Kaitie. Promise,” Abby said then her eyes lost their luster. Abby’s throat gurgled, and she shuddered. Kait was losing her sister. Her best friend. Her life. “No,” Kait cried to the empty room, forgetting all of her FBI training and searching for her next step. How could she help her sister? Her family. Her niece. Lily. She listened. Heard only her heart pounding. Abby’s labored gasps for air. They had to have heard the gunshots, so where were they? Had Fenton taken one of them hostage? “Don’t let him take them. Please, no. Please.” The whispered plea joined Abby’s last breath. Kait sagged to the floor. Pre-order Web of Deceit Now! My publisher is giving away FIVE print copies of the book on Goodreads so hop on over to Goodreads and enter to win. Sounds good! Love finding new authors! Thanks so much, Debbie for leaving a comment. I hope you'll check out Web of Deceit. I just finished an ARC of "Web of Deceit". I highly recommend it! Even though I'm now almost scared to use technology, lol! Thanks, Leslie and I'm sorry about giving you the fear about technology. :) I wish that part of the book was fiction. Loved the book! Shook in fear the whole read through! Sorry for the shaking, Becky, but glad you liked it! I'm so glad you enjoy writing series, because I love to read a great series! When you have the same characters throughout multiple books it feels like you're with old friends. I absolutely loved my advance copy of this book. Thanks for stopping by Michelle! Glad you loved the book!!! This sounds fabulous. I'm so looking forward to reading it. I love your books and the fact that you write series. Can't wait to hear what you think of it!! This book was fabulous!! You won't be disppointed. Susan Sleeman knows how to keep you turning the pages, staying up late, and putting your right in the center of an investigation. Thanks so much, Suzie. Sorry to keep you up at night, LOL! I also just finished reading this book and it's fantastic! You will see that Susan did a ton of research and it shows! The characters are so real that you think they really exist! I happen to live where the story is set and I find myself wanting to go meet them! A definite page-turner! Aw, thanks, Valri. I really appreciate your kind words!! I love reading a series because I know in the next books I will be meeting up with old friends. This one sounds good. I will be putting it on my wish list. Thanks, Joan. I appreciate your stopping by and leaving a comment. I hope you're able to buy Web of Deceit when it releases! So glad you discovered romantic suspense, Janice and glad to meet you, too. I hope you entered the contest and if you don't win, I hope you'll look for Web of Deceit to purchase. Thanks for stopping by, Brooke. I hope you entered the contest and if you don't win, I hope you'll look for Web of Deceit to purchase.